This rich and addictive, chocolatey Healthy Black Velvet Cookie Dough is all natural, sugar free, high protein, gluten free, AND vegan… oh, but you’d never know it. No need to pinch yourself because you’re not dreaming. This is real life. Surprised by the ingredients? 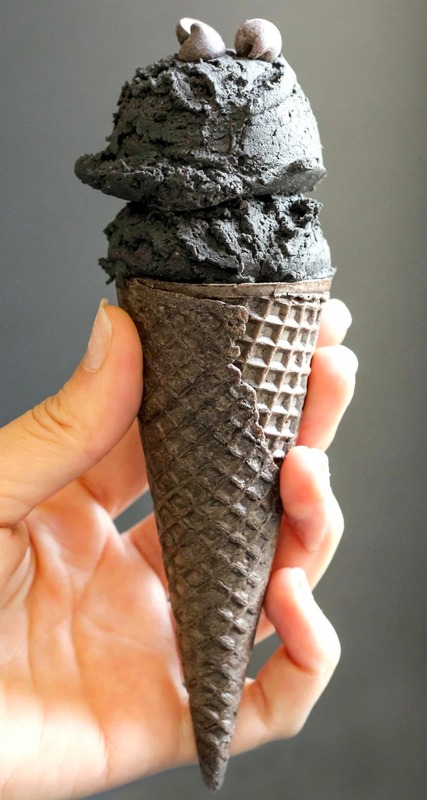 Surprised at how CHARCOAL got into your dessert? Don’t be. You don’t taste it at all. I was seriously skeptical myself at first, but couldn’t detect it one bit. 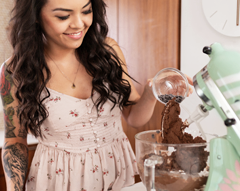 This Healthy Black Velvet Cookie Dough tastes just like regular cookie dough — it’s sugary sweet (without the refined white sugar), it’s buttery rich (without the butter, synthetic margarine, or hydrogenated shortening) and it’s doughy in texture (without the refined and bleached white flour). This Healthy Black Velvet Cookie Dough is meant to be eaten raw, so no hassle or baking required for this sweet, sweet indulgence. No eggs = lick the spoon (and bowl) all you want! 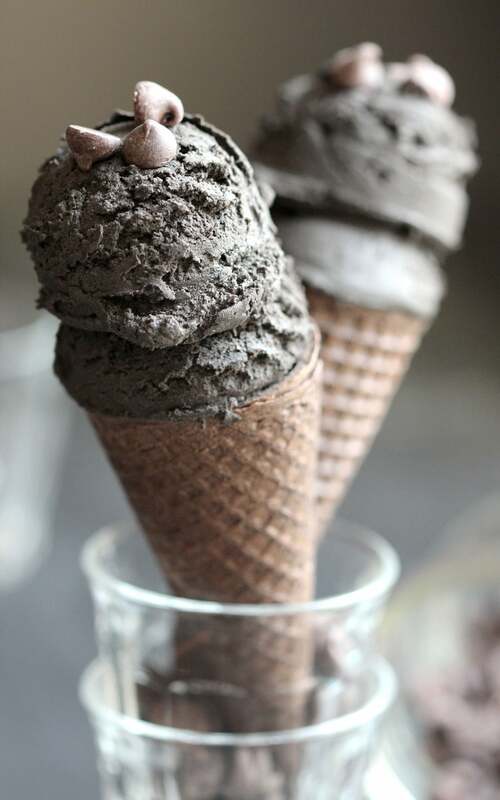 This rich and addictive, chocolatey Healthy Black Velvet Cookie Dough is all natural, sugar free, high protein, gluten free, AND vegan... oh, but you'd never know it. In a large bowl, add stir together the protein powder, oat flour, cocoa powder, charcoal powder, and salt. In a blender (I used my NutriBullet), puree together the beans, almond milk, almond butter, vanilla extract, butter flavor, and stevia extract until smooth. Scoop this mixture over the dry ingredients and fold together. For the best texture, cover and refrigerate overnight. Otherwise you can serve it immediately for a slightly softer brownie batter texture. Enjoy! Wow. Wow, wow, wow, wow, WOW. Can you believe this cookie dough is packed with a whopping 23g of protein and 11g of fiber?? Plus, it’s free of the deadly trans fats and has none of processed white sugar typical to storebought cookie dough. I am still a little shocked at how delicious and addictive this Healthy Black Velvet Cookie Dough is. I could NOT stop eating it. I mostly ate it straight up with a spoon, but it’s also delicious with graham crackers and animal crackers. Try it. It’s just TOO GOOD! Very cool looking! Who dosnt love cookie dough! 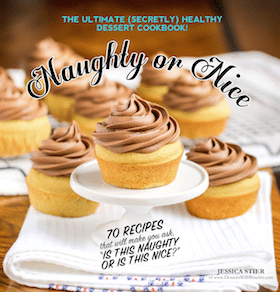 Jessica, this looks amazing, as does the black velvet fudge! I’m absolutely in love with your grey/black theme, and I think I might need to try some of this soon because it is just too gosh darn beautiful (and HEALTHY whaaaaaat). Also, I have always thought that the best part about eating vegan, hands down, is the freedom to eat as much raw cookie dough as you want 😉 I’m totally inspired by your healthy black velvet invention. Rad thinking! 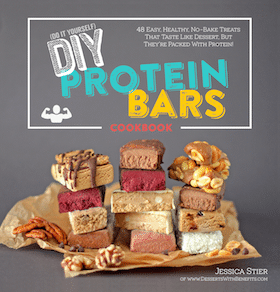 Could I replace the protein powder with more oat flour and leave out the butter flavor? Thanks! Can you actually bake it into cookies? This cookie dough looks fabulous! Charcoal is seriously making a striking debut, and it shows that you crushed this recipe! I would love to try it out! Question about the charcoal…First off, love the colour. I see it now in a lot of your recipes…Are you doing it for detox? Or just colour? Also – I am very allergic to oats. Any chance coconut flour, almond flour or more protein powder would do the trick? I’m using charcoal simply because it looks awesome and I love the color! But some people do consume it for detoxing purposes. I haven’t tried this recipe without the oat flour so it’s hard to give an answer. If you want to test some of those flours, feel free! I’d probably do 3 tbs coconut flour and keep some extra on hand in case you need more. How long will this keep after I make it? Delicious recipe,btw. 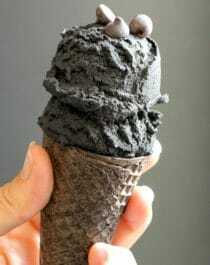 I made it with raw honey instead of stevia and left out charcoal since I don’t have any. Mmmm raw honey sounds like it’d be delicious! I’ve gotta try that sometime! Im not going to be the one to take the time to make this as I have SEVERE fibro etc. BUUUUUUT if someone, ever makes it & sells it online….somebody puhlease let me know!